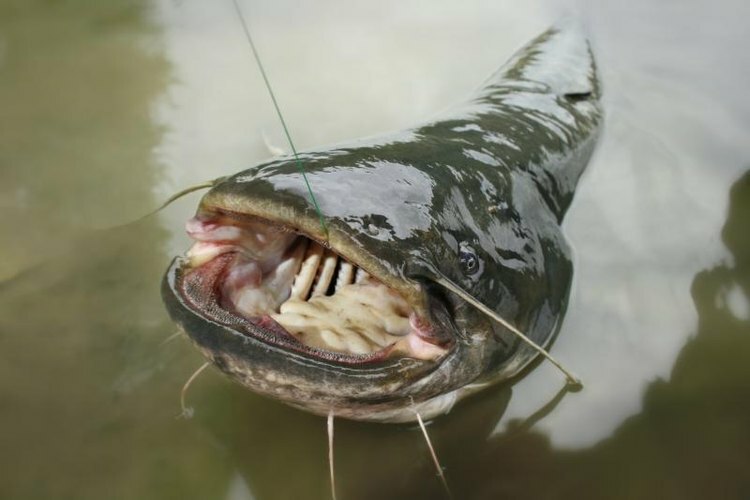 Some catfish baits can take weeks or months to prepare. Anyone in search of a homemade alternative to store-bought catfish baits has a lot of options to choose from. Catfish bait recipes vary drastically in effectiveness, and some are easier to make than others. Punch baits and dip baits, for example, may require several weeks to ferment or ripen. Dough baits are a much easier option, and can be made with a few easy-to-find ingredients. To make your own catfish dough bait, start with water and flour, and combine these two ingredients to form a firm ball of dough. You can also use corn meal, oats, crushed breakfast cereal or bread crumbs instead of -- or in addition to -- plain flour. The dough should be soft enough to mold into shape without crumbling, but thick enough to stay on a hook. This dough by itself is not particularly effective as bait, and that's where additional ingredients come in. Most catfish dough baits include some type of meat product to attract fish. Beef or chicken blood is a common ingredient, along with chicken livers, whole minnows, dog food or canned tuna. Incorporate any of these ingredients into the dough using a blender or food processor. Many anglers prefer to let meat, fish or blood ferment before adding it to the dough, which can make it more attractive to catfish. Other possible ingredients include cheese, garlic, salt, anise oil, onion powder and fruit-flavored powdered drink mix.